Elektron has found many fans in recent years with powerful samplers and drum machines like the Octatrack MkII, Analog Rytm MkII, and Digitakt. Each of those devices includes great sound engines, quality drum sounds, and the ability to sample your own, while being versatile enough to allow electronic musicians to ditch their laptops. But while powerful, they can be a bit complex, especially for a musician new to such technology. Today, Elektron unveils the Model:Samples, which features some of the same sampling and sequencing magic found in the rest of its lineup in a small and straightforward machine. It's a six-track, sample-based groovebox that Elektron calls its "most affordable, compact, and lightweight instrument ever." It's expected to retail for $399 USD. While it comes with 300 preset sounds curated by Splice.com, you can easily load your own samples on it through the its mini USB port. That said, this is the only way you'll be able to add your own samples. Unlike similar machines, there are no audio inputs—meaning you can't record audio directly into the sampler. 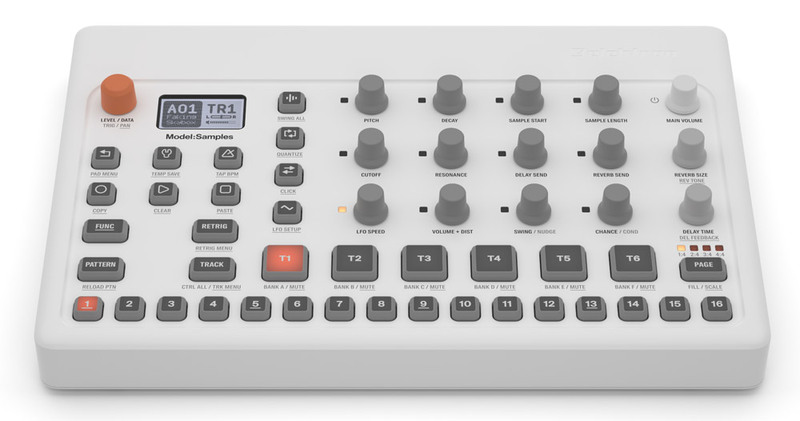 As you can see in the photo above, the layout of the Model:Samples is exceptionally clean, with simple front panel buttons, knobs, and velocity-sensitive pads. This last point is a distinguishing feature—neither the Octatrack nor Digitakt have velocity-sensitive pads. Samples or preset sounds can be tweaked with a variety of parameters—including one resonant multimode filter and one LFO per track, as well as delay and reverb effects. To create a rhythm, you can either play live, record your own beat (and add quantization) in real-time, or input your rhythm through the sequencer (up to 64 steps per track). The sequencer can handle up to six tracks simultaneously, each of which can control other machines through MIDI, allowing the Model:Samples to be the brain of your rig—all at just 1.8lbs. For all the latest product releases coming out ahead of next week's NAMM convention, check out our ongoing NAMM 2019 coverage.